Not a follower of the group yet? Check out our social media feeds for Facebook & Twitter. 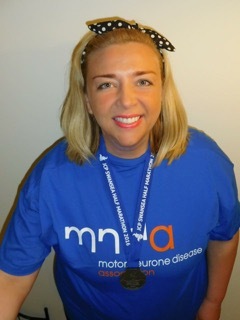 ​Kristen is running the London Marathon 2017 to raise £2500 of vital funding for the Motor Neurone Disease Association, a charity which has become incredibly important to her. 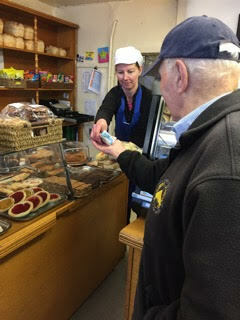 "In January, one of the most important people in my life was diagnosed with MND; the most intelligent, supportive, selfless, generous, active, witty and all round brilliant person I know"
North Wiltshire Group supporter, Cyril Foulds has been selling this years brood of Easter Chicks to businesses in Malmsbury raising £149. 90 year old Cyril lost his wife to MND and since moving to Malmsbury has become well known in the local community where he walks every day. He says "I just want to help in any small way that I can because I know what an excellent job the group do to support local families with MND". Thank you to all those who knitted the chicks and to all the Malmsbury businesses for their support and thank you Cyril - 90 years young we think! 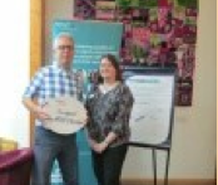 Wiltshire Council and the Wiltshire Clinical Commissioning Group (CCG) have jointly signed a charter pledging to do everything they can to support people with motor neurone disease (MND) after a Wiltshire resident campaigned to raise awareness of the disease. If you are in or near Melksham on Wednesday 8th March, pop along to John Stuart Funeral Directors, 10 Bank Street, Melksham who are holding a fundraising event in support of MND North Wiltshire Group. Hosted by Tom and Karen, there will be lots of lovely cakes to buy and a tombola to try your luck at winning a prize. Ruby and her chirpy brood of knitters have been clicking away with the knitting needles and produced dozens of cute chicks. 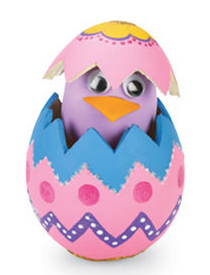 Each will be filled with a chocolate treat and need a new nest before Easter arrives. We are searching for new outlets for our 2017 hatchlings, so if you're willing to sell a dozen or two in the run up to Easter to friends, family or workmates then please let us know. Donation of £1.50 per chick. 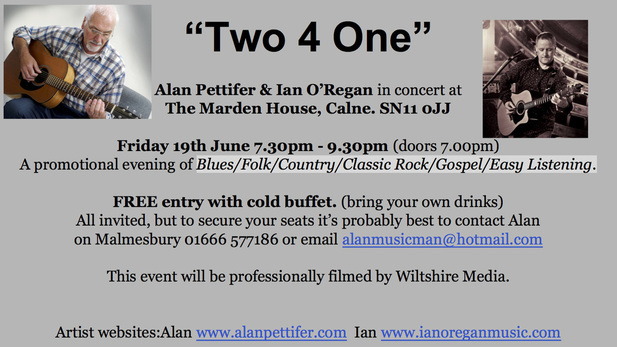 All money raised will go to North Wiltshire Group's funds to support local people who are living with MND. Email info@mndnorthwiltshire.org.uk for further information. CONGRATULATIONS RUBY - 90 YEARS YOUNG TODAY! 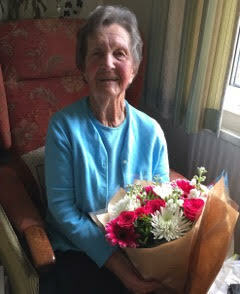 We send our sincere thanks and love to Ruby Collison who is celebrating her 90th birthday today. 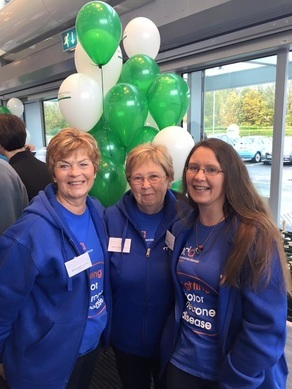 Together with her daughter Anne, Ruby founded the North Wiltshire Group after the loss of husband John to MND nearly 30 years ago. Ruby has been a stalwart fundraiser for The Association and together with her family has helped to raise over £250,000 over the years and she is still as committed as ever to our cause. Her jams are legendary, with many customers coming to our charity stalls just to buy them. 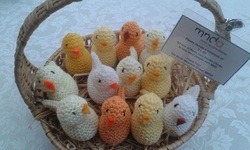 She and her band of knitters create Easter chicks and Christmas stockings for us to sell and she still takes part in the Malmesbury charity stalls run by her daughter Anne. Ruby, we salute you and wish you a very Happy Birthday! We were delighted to welcome so many of our local MND families to our Christmas support group meetings held in Swindon on 6th December and Calne on 15th December. Old friends had the opportunity to catch up and lots of new friendships were made. Thank you to all our lovely supporters, volunteers and health and social care professionals for helping to make these events a success. My name is John Howell and I am aged 69. I have been married for over 46 wonderful years and have two fabulous daughters and three beautiful granddaughters. I was diagnosed with MND in November 2014 having noticed a slight weakness in my left arm and leg in the autumn of 2013. My doctor thought this was nothing more than a minor muscular problem but as time went on he decided that greater tests were required and inevitably this led to the news that it was MND. Fellow sufferers will know what the devastating diagnosis and the resulting impact has on the whole family. A referral to the John Radcliffe Hospital in Oxford gave me the news that I was on the slower side of progression albeit not the slowest. So with this in mind we made the decision to carry on our lives as normally as possible. Our main concern for the future was the need for better access to sleeping and toilet/washing facilities. Our house is small with facilities upstairs and one of our two bedrooms is reserved for our lovely grandchildren, who regularly stay with us. We shared our concerns with the Social Services Occupational Therapist who suggested that a through floor lift was the answer. Sounds like a good idea but…..
Having some savings, we would not qualify for a grant, the cost of instillation is high and it would effectively take out the second bedroom, meaning that our grandchildren could not longer stay with us. We knew we needed to be practical but this just felt too much for us to consider; and that our feelings were not being taken into account. As a family trying to cope with a devastating diagnosis we needed understanding and a willingness to help us through our worries. Shortly afterwards our Association Visitor Alison Aviss (Chair of the North Wiltshire Group) came to visit us for the first time and after listening to our concerns asked what we would ideally like to happen? 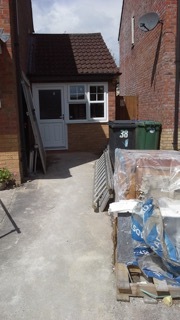 Well, that was easy to answer – the ultimate solution would be to convert the garage into a bedroom and bathroom but we were worried that we simply would not be able to afford it! Alison told us that we could start a fundraising appeal for this and although we were very skeptical at first, a plan was developed, starting with an article in the local newspaper. Very quickly, our family got behind the idea and we became very busy thinking about how to approach this. The garage conversion cost quotation came in at £15,000. How would we ever be able to raise this much? This was a big and hard step to take as in effect we were opening us up to everybody and perhaps even criticism. We’ve always been a private family and never asked for anything. But nevertheless we decided to go through with it and subsequently the story was printed and picked up by other regional newspapers and then the BBC. I found myself speaking live on the radio about what we were doing and why and also raising awareness of MND and the work of the Association. At the same time we opened up an account on the ‘Just Giving Website’. The effect was immediate and donations started flooding in to the account from well-wishers all around our small town and beyond. Friends decided to organise several functions such as a Tea Dance, Barn Dance and a quiz night in a local pub. Our daughters approached small business in and around the town to see if they would be willing to offer items for raffle prizes at these occasions. Everyone was so forthcoming and all the events proved a runaway success. Our chosen builder promised to keep costs down, likewise a family run business in town donated everything for the wet room. Thanks to so much generosity we managed to raise £13,000 towards our target leaving a small amount for us to self-fund. Works are now completed and the room occupied. My whole family is so grateful to everyone who helped us and they will never know how much we appreciate their generosity. I do have a few tips…. 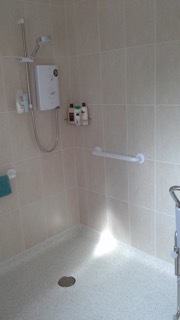 it is vital to engage with a builder that is familiar with conversions for disabled people and also to make full use of all local occupational therapists both from NHS and social services. It is also important to ensure that you have all your personal needs catered for and the whole issue should be project managed by yourselves or someone that can act knowledgeably on your behalf. I hope my story will inspire others suffering from this dreadful disease to take a similar line and reach out for help when all seems lost. There are some wonderful people out there just waiting to give a helping hand. Comment by Alison Aviss, Association Visitor. I am so proud of John and his family for taking up the idea of crowd fundraising, which I know was very difficult for them. It is not an easy thing to share your personal story with strangers and on social media but the results of the fundraising speak for themselves. It is lovely to see John being able to enjoy the new, bespoke facilities and the improved quality of life these bring. Our grateful thanks go to Tricia Lawrence and the trustees of the Martin Lawrence Memorial Trust for the fantastic donation of £3176.00. The funds were raised at a golf day held in Rutland, where Tricia and Martin used to live and are shared between the Trust and North Wiltshire Group. The trust helps young people in Africa and the UK through education and sport. Tricia and her daughter Susannah are supporters of NorthWiltshire Group and having moved to the area, Tricia is currently on the Association Visitor training programme. 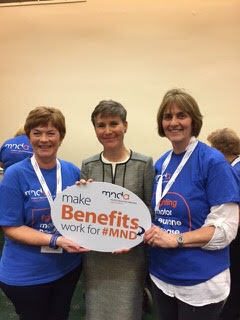 Members of North Wiltshire Group attended the MND Association Parliamentary Reception today to increase MPs’ awareness and understanding of MND and the issues that affect people living with the disease, their carers and families. The event was also an opportunity to talk to MPs about the importance of Attendance Allowance (a disability benefit for over 65s). The Government is considering changes to the benefit and we want MPs to understand why we want the benefit to be retained in it’s current form. 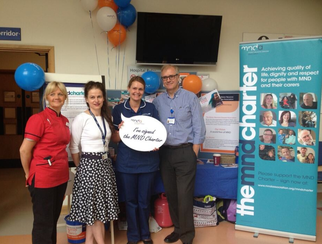 The Motor Neuron Disease (MND) Association has provided funding for a new specialist MND Clinical Care Coordinator post in Swindon, as a one year pilot. 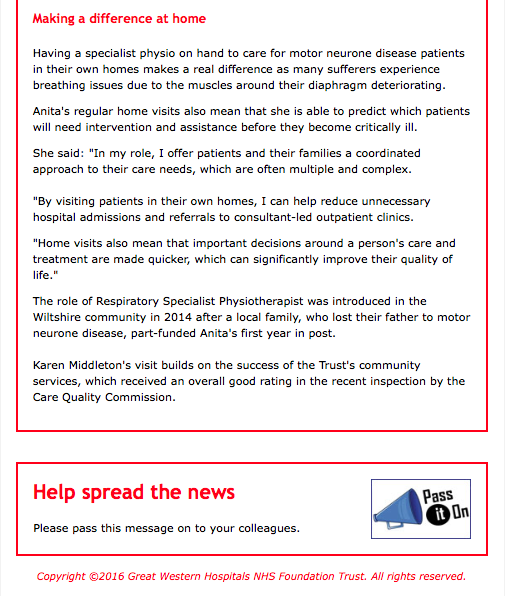 There have been massive improvements in care for people living with MND and their families in the Wiltshire area, following the appointment of a Specialist Respiratory Physiotherapist. This was initially part funded by a local family before being funded by the Clinical Commissioning Group. We wanted to ensure people in Swindon were receiving the same level of care. Recognising the importance of equality of care within the county, the Association agreed to use funds raised from the Ice Bucket Challenge in 2014 to fund a MND Clinical Care Coordinator post for Swindon as a one-year pilot project. Work closely with the MND Association, Association Visitors and the North Wiltshire Group to ensure that the best possible support is being offered to families. We welcome Dorinda ​Moffat to this post and are very excited to be working with her. 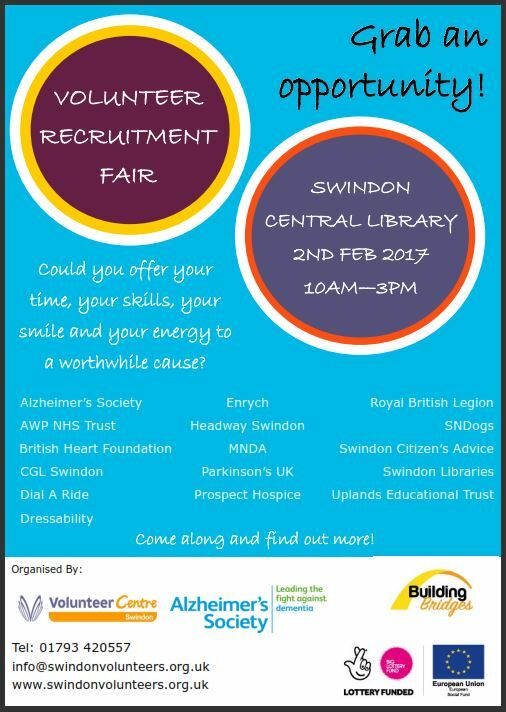 The Association has partnered with SEQOL, the Health and Social Care Social Enterprise that provides community services in Swindon to create this part time post. Dorinda commenced in the role on 1 June 2016 and is already making a vary positive impact. She joins with physiotherapy experience from Prospect Hospice, where she still works and we hope that an additional benefit of this pilot will be to bring together community and palliative care in the area. Neil Drinkwater, Regional Care Development Advisor for Bristol and West from the MND Association, will support a steering group of stakeholders to monitor the progress of the role and build a case for beyond the one-year pilot to secure the best possible care for people living with MND in the Swindon for the future. Our very grateful thanks go to Sharon Watson and all her family and friends for the fantastic donation of £1,400. 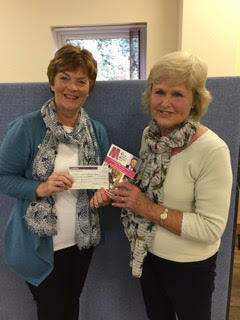 The North Wiltshire Group shared the benefit of funds raised from an event on 9th July with the Early Phase Clinical Trials Unit (EPCTU) for cancer treatment from Churchill Hospital in Oxford. 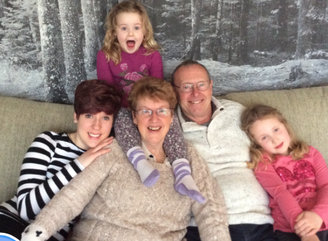 The family wanted to raise funds in thanks for the support they had received from EPCTU in memory of Sharon's husband Paul and for MNDA North Wiltshire Group who supported her father Ray Jennings during his recent fight with MND. Getting to know Prospect Hospice from Prospect Hospice on Vimeo. Susanne Webb, Association Visitor and North Wiltshire Group committee member, opened her lovely garden to the public as part of the Old Town Open Gardens event. 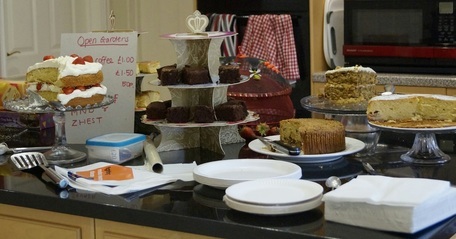 Throughout the afternoon visitors enjoyed a cup of tea and slice of home made cake after wandering round Sue's garden. In all, 10 gardens and an allotment were opened to visitors, some providing cream teas, refreshments, plant and craft sales, as well as a chance to look at some well tended flower and vegetable beds. Money raised from the event was shared by the North Wilts Group of MNDA and Zhest (Zimbwabe Health, Education and Sustainability Trust), each receiving a fantastic £500. 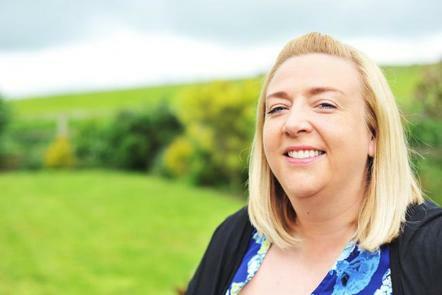 On Saturday 9th July, Sharon and her family are running a charity event at The Supermarine Sports and Social Club, South Marston from 7:30 - 12 to raise money for two charities that are close to their hearts. Tickets are £10 for Adults and £5 for Children, there will be a raffle, silent auction, buffet and disco, as well as speakers from both charities. This week is carers week and at the Association we recognise and value the vital role played by family and unpaid carers.While we strive to ensure those living with the disease achieve the highest quality of life possible, we are also committed to doing all we can to support the families and carers of those living with MND - that's why the Association has recently revamped its Caring and MND: support for you guide designed to help family or non-professional carers who support a person with MND. The guide was produced in consultation with carers and experts, including our campaigns team member Usha Boolaky, as part of her role at the Institute of Public Care, Oxford Brookes University. Go to our carers for more information and support. 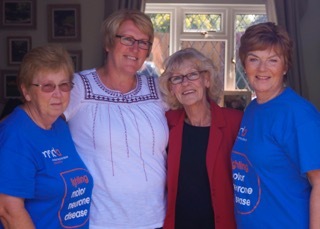 Sharon, Tom and Barbara held their annual Bake It for MND on 4th June. 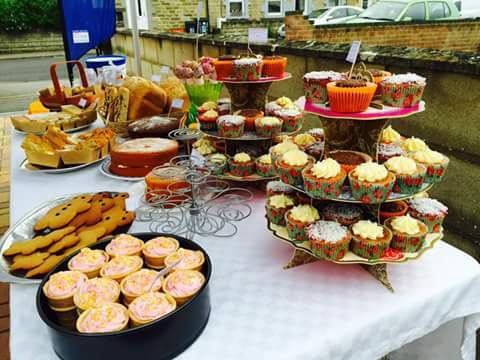 A total of £210 was raised from the sale of cakes, breads, preserves and plants. Thank you to all those who contributed and supported. 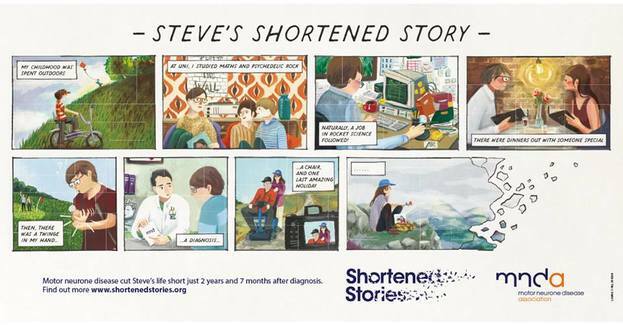 Throughout June we are sharing stories of real people whose lives have been, or will be, cut short by motor neurone disease. We congratulate Dr Annabel Nickol and her team at the Oxford Sleep Unit for winning an Extra Mile Award. Anita Sinclair, Respiratory Specialist Physiotherapist for Neurological Conditions nominated them for their exceptional dedication to car and support to MND patients with Respiratory Needs. Anita said "Dr Nickol and her team have been absolutely instrumental and timely with providing ventilation expertise and support to our Wiltshire patients. This has resulted in the reduction in crisis management and ultimately prevented unnecessary hospital admissions. Referrals are seen extremely promptly and they go the extra mile to make sure patients are well equipped with on-going follow up. As a community Respiratory Specialist Physiotherapist working in a rural county this has been a real support and reassurance to know that Dr Nickol and her team are available to provide this care with excellence." A huge thank you to Keith & Jean Miller and Roy & Karen George for donating the proceeds of their recent charity Soul & Motown Disco to the North Wiltshire Group. The donation was made in memory of their late friend John Daniel, a local man who suffered from MND. 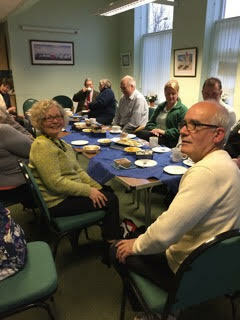 The event reaised £715 and was held at the Coleview Community Centre who provided their hall free of charge. From the 18th May 2016 for 1117 miles over 15 days Dougal Campbell will be riding from Lands End to John O Groats to raise funds for the MNDA. If you wish to show your support Dougal's just giving page is www.justgiving.com/fundraising/followthehat alternatively you can text GTDM68 £5 to 70070 to donate £5. 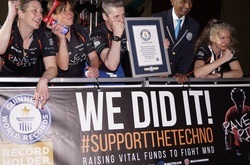 Congratulations to Steve Smith and his fantastic Rave & Ride team for their amazing achievement in gaining a Double Guinness World Record title on Saturday 14th May at Stoke Park. Over £30,000 was raised during the 8 hour challenge which followed the "Watt Power Can We Achieve?" challenge earlier in the morning. Money raised will be added to funds already raised by Steve towards funding a fellowship at the University of Oxford. Well done to Graham Crook for representing the group by participating pedalling like crazy for an hour in the "Watt Power" challende. Thanks to everyone who supported him and donated. During the spring break I set myself the challenge of climbing Mount Kilimanjaro in Tanzania, Africa. 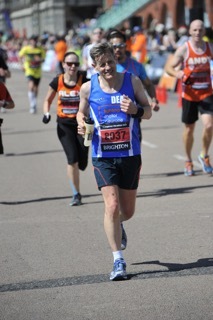 On a personal note, this challenge was in loving memory of my father, who passed away as a result of MND. 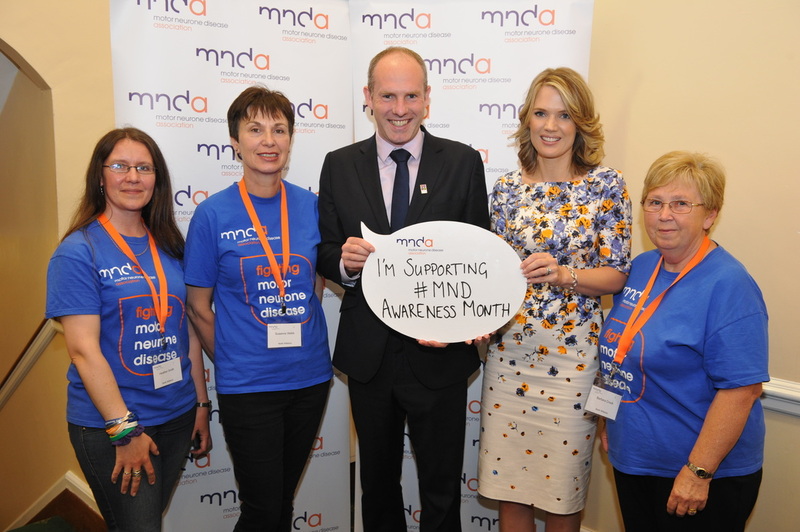 My trek was part of a growing drive to raise awareness and funds for the MNDA, who are committed to successfully combating Motor Neuron Disease. The trek was physically and emotionally challenging, but quite honestly the most amazing experience. I am very proud to say that I reached the summit; 5895m above sea level, where I was privileged to watch the sun rise over the Serengeti. I am truly grateful for the support that I have received and would like to extend a big Thank You to everyone who sponsored me and gave me kind words of support. With a combination of my just giving page, much loved page and a fundraising BBQ, I am proud to say we raised over TEN THOUSAND POUNDS for the MNDA! A big thank you to all involved in this year's Easter Chick event, we are delighted to tell you that we have raised an amazing £746.91. This would not be possible without the support of our willing knitters and volunteers who sell the chicks at every opportunity. Grateful thanks go to Sainsbury's Stratton, Sainsbury's Royal Wotton Bassett, Marks & Spencer Swindon and MidCounties Co-op who all donated generously to help us reach this amazing total. 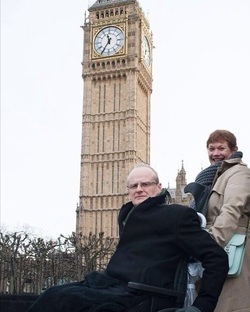 After being diagnosed with Motor Neurone Disease, Ted goes on the trip of a lifetime and so does his pet fish. He rushes to experience the world, from the markets of Lille to the romance of Venice. 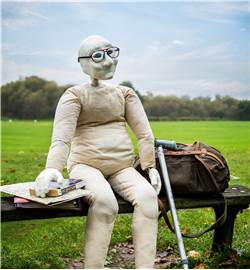 Humorous, heart-warming and uplifting, CELL features charming puppetry, physical theatre and an original score to tell the story of one man’s final adventure to create enough memories to last a lifetime. "So we told the MP's our story. We told them about how we were once two professionals and how our lives had been devastated by Mark's condition"
Listen to John's interview on BBC Wiltshire - 01.26 to 01.40 - http://www.bbc.co.uk/programmes/p03jls8r#play. 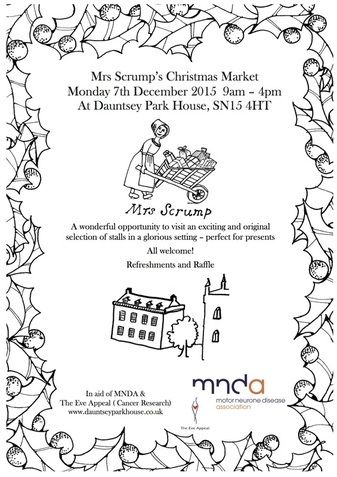 The Mrs Scrump's Christmas Market is returning to Dauntsey Park House! This very special Christmas Sale is taking place on Monday 7th December between 9am and 4pm. Please come with family and friends and enjoy a distinctive and exciting selection of stalls gathered in such a glorious setting. Locally based ‘Mrs Scrump’ will have a tempting choice of hedgerow and veg patch jams, jellies and chutneys as well as homewares. She will be joined by friendly stallholders selling brilliant solutions to your Christmas present lists. Beautiful wreathes and Christmas arrangements from ‘Treez and Flowers’ to take away or to order. Entrance is free. There will be a Tombola and a luxury Beauty Lucky Dip. Tea, coffee and delicious home-made cakes will be available all day. Proceeds going to MNDA (Motor Neurone Disease Association) and The Eve Appeal (female cancer research). 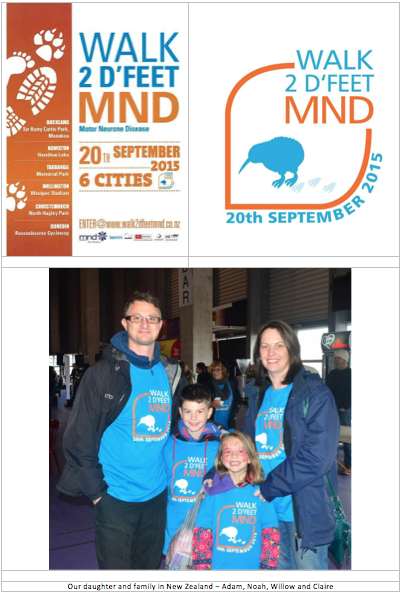 Family of Pete Garner who is living with MND in Swindon, completing Walk 2 d’feet MND in New Zealand. Sunday 11th October is the date for the Lions Club sponsored walk, when people participating can raise money for their own favourite charities. 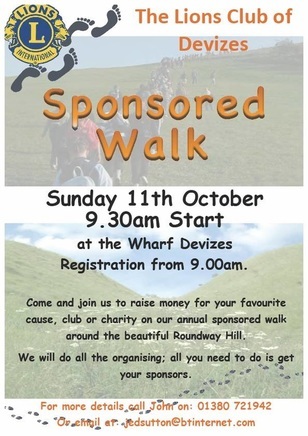 The route of about 10 miles follows the roads and tracks onto Roundway Down, starting at 9.30 am from Devizes Wharf. Last year, the Devizes Lions Club charity walk raised a generous amount of money for the North Wilts Group through sponsorship. If you, or anyone you know, would be interested in taking part in this year’s event on 11th October, then please emailinfo@mndnorthwiltshire.org.uk and ask for a sponsorship card. One card will take up to 12 sponsors, so please state how many cards you require. Our North Wilts Group of the MNDA challenged the Zurich Community Team to help them to increase awareness of MND during the June month of awareness. 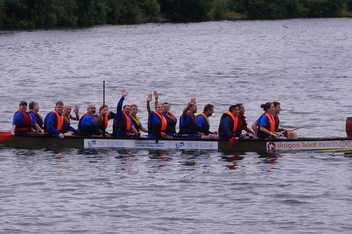 The enthusiastic team took part in this year's Rotary Club Dragon Boat Race and despite a grey drizzly start to the day, the Team's spirits were definitely not dampened. Following the third qualifying round ZCT were knocked out of the race, however although they did not receive a trophy, each team member is a winner in our eyes. Thank you ZCT! We were delighted that Justin Tomlinson, Minister for the Disabled and MP for Swindon North was able to meet us at the parliamentary reception which followed the MNDA Charter presentation to Downing Street. Heather Smith, Susanne Webb and Barbara Crook were priveleged to represent the North Wiltshire Group and took the opportunity to provide Justin with details about the group's work. Robert Buckland, MP for Swindon South also attended, arriving just in time to hear the very moving speeches. Please help us support Beth Daniel who is walking Kilimanjaro in March 2016 in aid of the Motor Neurone Disease Association. 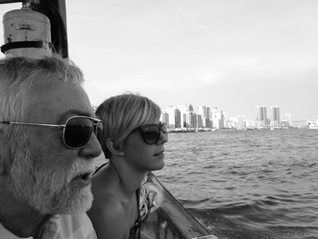 Beth's father, John, passed away in January 2013 as a result of MND. 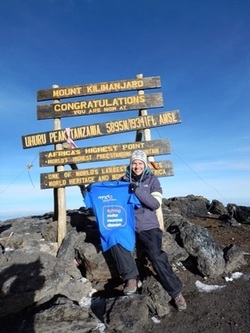 Beth will be out and about during this summer raising funds towards the cost of taking part in this challenging trek. We will keep you posted with her progress and hope that you will support her to meet her goals. Sisters Sophie and Kitty Strange came up with an "eggcellent" way of raising funds for the North Wiltshire Group this Easter. They organized a "cracking" Easter Egg hunt and raised an "eggstraordinary" amount of money, in "eggcess" of £50. Well done girls! 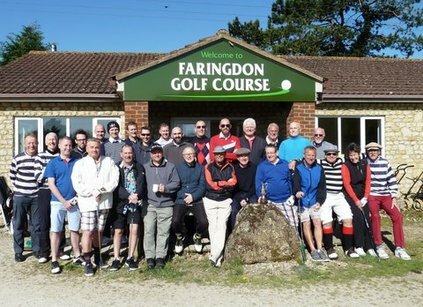 Ben Hollick recently organized a golf day at Faringdon Golf Club. The object of the day was to raise money for the Motor Neurone Disease Association in memory of John Daniel (Danny) who died as a result of MND on Jan 6th 2013. Friends from far and wide were invited to take part, paying a fee to play. “Best dressed golfer” & “Best dressed team” titles were awarded together with highlights of the day being celebrated. Following this, Ben invited friends back to his home where Mary, Christine, Carol, Liz and Lesley provided some great food & drink. This was followed by a table tennis competition. A good time was had by all and there is talk of a repeat event next year. 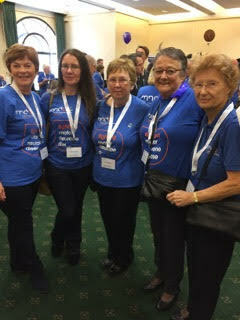 The golf event raised £430 with a further £95 being raised from the sale of MNDA goods and donations. All this money has been donated to the North Wiltshire Group, who have been very supportive to Danny, Christine and their family. 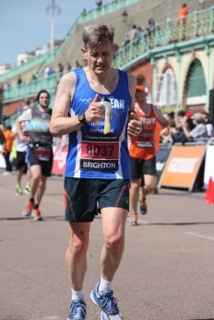 Dean Saunders ran the Brighton Marathon! Amazing achievement and stats......! 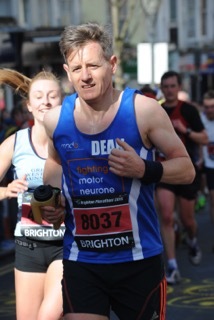 Having completed the Marathon, Dean said "I had a fantastic day and the spectators were just brilliant, I had my name on my MND vest and everyone was cheering me on all the way round, and it was so so helpful in those last few miles. I stuck to my plan for the race and it seemed to work and I finished in 3 hrs 32 mins which I was very very pleased with, especially as it was my first marathon, my friend with MND, Lynne Haines, was over the moon. I hope all the MND runners did well and that we have raised lots of money. It was one fantastic journey to get to the start and finish line, especially as I had always said there was no way I could or would ever do a marathon, it just seemed a distance too far, but I have proved to myself that with enough hard work, determination and incentive anything is possible! One thing that I will always remember which was on a runners vest 'Pain is temporary, Pride is forever' just sums up those last few miles. Dean's Just Giving page now stands at £2,089.26 which is brilliant, a huge thank you to everyone who made a donation, I know Lynne and the MNDA are thrilled. MNDA had 75 runners and we all finished, the overall total raised for MNDA at the event will be announced quite soon. 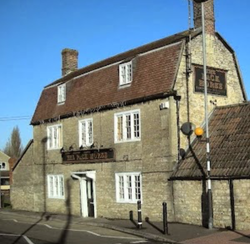 A fundraising event is being held at the Pack Horse Pub, London Road, Chippenham, on Saturday 30 May. A fun night is planned with the Mick O'Toole Band playing, a raffle with lots of prizes and the opportunity to win a weekend break in Llandysul, mid Wales. 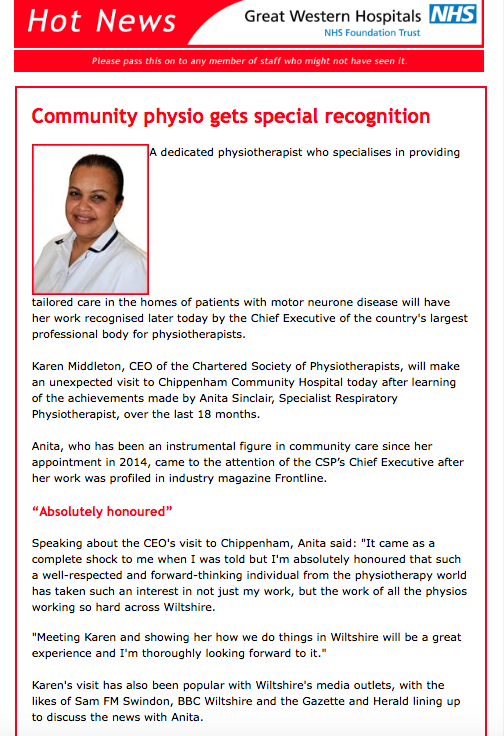 ANITA IS RECOGNISED FOR GOING THE EXTRA MILE! 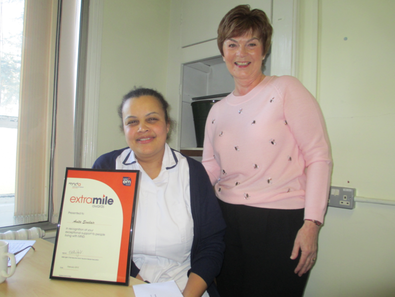 Specialist Respiratory Physiotherapist, Anita Sinclair has received an Extra Mile Award from MNDA. These awards are designed to recognize those health and social care professionals who go the extra mile and really put themselves out for the families affected by MND. Heather attended the AGM on 13th September. As expected, there was a lot of talk about Ice Buckets! 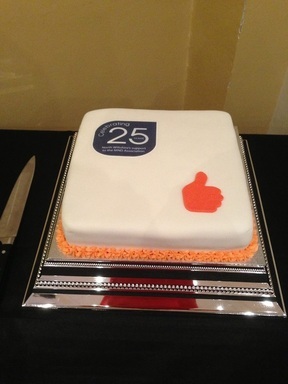 A presentation was made to Paula and Robert Maguire, who brought the idea over to the UK. Sally Light’s report praised their work and all the support the challenge had had, and Anne Bulford, the Treasurer from the Trustees, was able to add that, even without the Ice Bucket challenge, the income for this financial year was at record levels. It was lovely to see the work of the North Wilts group represented in the exhibition stands and the workshops. The Volunteering stand had a slideshow featuring images of the cake sale at Nationwide and the presentation of the cheque following the Jovial Monk golf day. The Campaign stand had a focus on recruiting more campaign contacts, featuring images of the current contacts, including Heather. The Campaign workshop also featured a recruitment video with contacts talking about why they campaign, their relationship to MND, the importance of campaigning, and how easy it is to get involved. A great opportunity for Heather to talk about the excellent work in North Wilts! 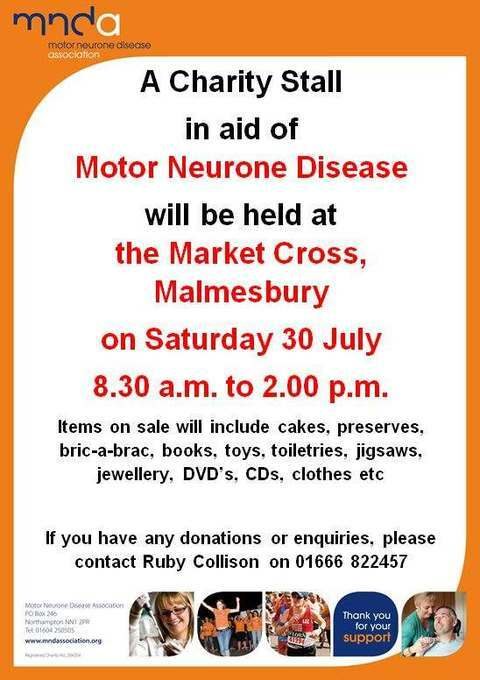 PLEASE TRY AND HELP THE SALISBURY MND BRANCH GET GOING AGAIN!! On Sunday 19th October they are having a Sports Dinner and Auction and Dame Sarah Storey, Britain's most successful Paralympian, will be the after dinner speaker!! The event takes place in Salisbury (The Chapel, Milford Street) starting at 7pm. Tickets are £45 per person or a table of ten for £400. This includes entry to our prize draw, reception drinks, two course meal, the after dinner speech, sports auction and live music to close. They are also seeking corporate support and would be delighted from businesses who would like to sponsor a table, to include advert in event programme, logo on table, logo and link on website and mention via our social media accounts (Facebook and Twitter). Please visit www.redcard4mnd.co.uk for tickets and more information. 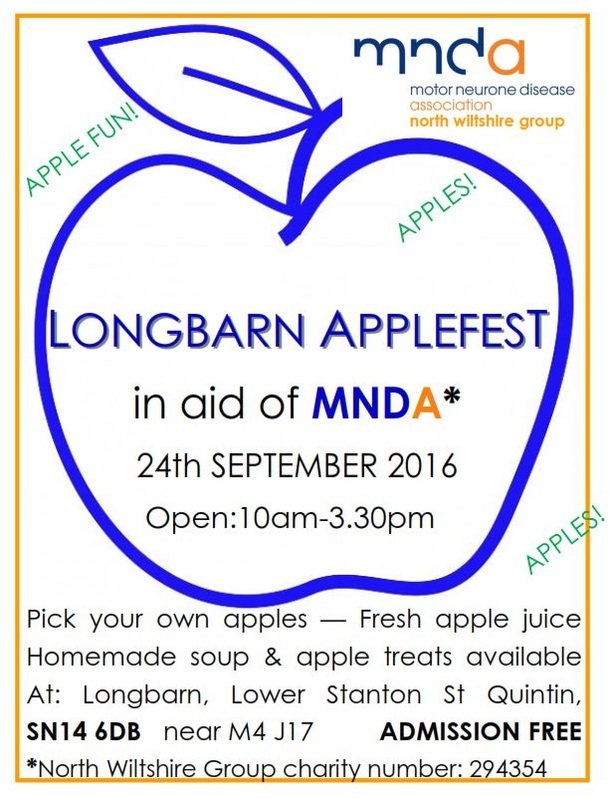 THE MOST ENCOURAGING NEWS FOR PEOPLE LIVING LOCALLY WITH MND….. The family and friends of Martin O’Shea from Corsham started raising funds for the Association and awareness of MND when he was diagnosed with the disease at the age of 48. 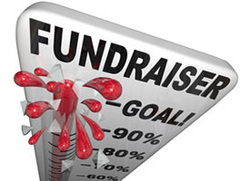 Very quickly, the whole community was fundraising and it was clear that large sums of money would follow. Martin wanted money raised in his name to ‘do the most good possible and to help all those who are affected by MND’ so in discussions with him and his family we had the idea of trying to create a new post to fill the gap in community services to those with MND. Using this money, we have been able to work with the Clinical Commissioning Group to create a new post of Specialist Respiratory Physiotherapist with special responsibility for Motor Neurone Disease. 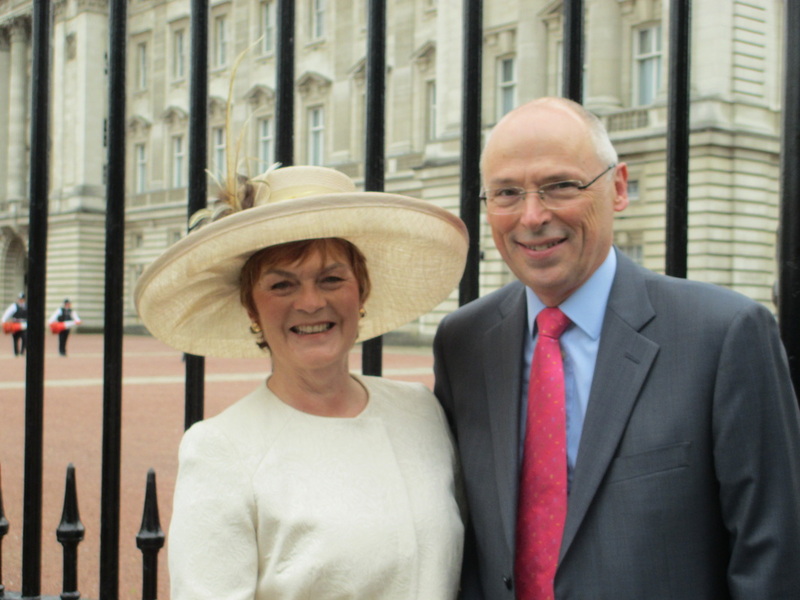 Martin’s legacy fund and the NHS are jointly funding the post for the first year. MND North Wiltshire has been nominated to be one of the chosen charities for the Waitrose Group Community Matters for this quarter. We are competing against 2 other charities for a share in the £3,000 the store will give away. Customers at John Lewis Home and the new Waitrose supermarket in Wichelstowe, will receive a green disc when they make any size purchase. They can then choose to drop a disc into the box of the charity of their choice. Each charity will receive a share of the £3,000 according to the number of discs they receive. Every 'disc' counts - so please do take the chance to vote whenever you can if you are shopping at the John Lewis Home Store at Mannington or the Waitrose supermarket in Wichelstowe. we reached the 38th event! Funds are still coming in but expected to be over £8,000! This is truly a record-breaking amount and in addition to the 300 signatures achieved for the Charter. This is only achieved by lots of hard work, organisation and passion from our team and all those of you who have helped us by holding Bake it events, campaigning, selling raffle tickets, organising store donations to name but a few. A massive Thank You to All. See our News & Events and Fundraising & Donations pages for more information on some of the actions and events held in June. 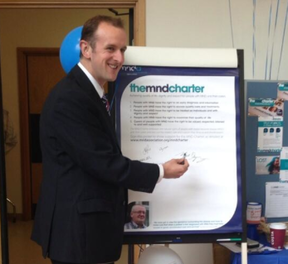 As part of June MND Month of Awareness, we held a Charter Signing event at the Great Western Hospital in Swindon. 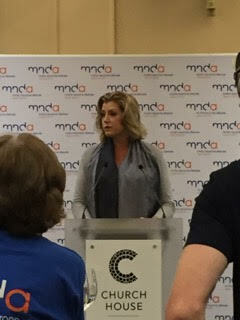 Leah Baigel, Clinical Nurse Specialist for MND who convinced senior hospital executives to support this initiative, made the event possible. We are very grateful to Leah, Dr Graham Lennox and the senior hospital executives for this excellent opportunity. Senior executives of the hospital showed their support by signing, together with many members of staff, visitors and also patients. Three Labour councilors, Anne Snelgrove for South Swindon, Mark Dempsey for North Swindon and Chris Watts for Devizes, also showed their support by coming to sign. The current MPs for Swindon have signed previously. During June we were grateful for the opportunity to visit the Hos- pice to collect more signatures for the Charter. This reflects the excellent working relationship that we have built with one another. 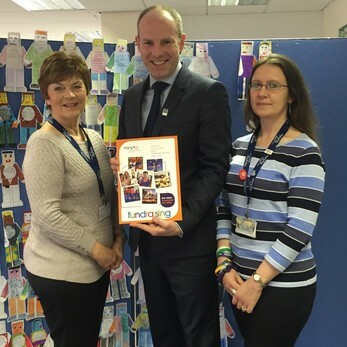 Pictured with Alison Aviss, Chair of the North Wilts Group, are Angela Jordan, Chief Executive of Prospect Hospice and Tim Willis who is Chair of their board of trustees. 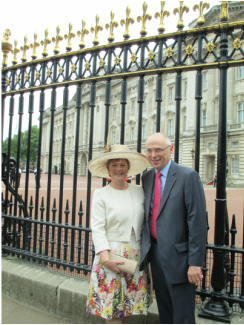 I was absolutely thrilled and felt very honored to be nominated by the Association to attend the Buckingham Palace Garden Party on 21 May and to be able to share the day with my husband, Paul. The whole experience was fabulous and as you would expect organized perfectly. We arrived some time before the gates opened and there was a lovely atmosphere amongst the guests, all in their finery and with different stories to tell. Some Japanese tourists were intrigued by the clothes and hats and wanted to take lots of photos! We had a lovely afternoon tea and shortly afterwards we were very lucky to be on the front row of the line that Her Majesty The Queen walked along, stopping to speak to a group people who were next to us! We thought this was amazing and then one of the equerries spoke to me briefly and said he would like to present me to the Duchesse of Gloucester! Wow, I suddenly felt quite nervous but I need not have worried. The equerry made quite a few notes and explained the protocol of addressing the Duchesse, explaining that she would be interested in a two-way conversation. Thankfully, my curtsey seemed to work and we did indeed have a lovely conversation for over 5 minutes. She was very interested to hear about why I volunteer, the work of the Association and what we are doing in the North Wiltshire Group. She was absolutely charming and this was a real highlight of the day. In summary, it was a magical day and something that we will both treasure. Thank you so much for allowing me to represent the Association. Anne and helpers will be running an MND charity stall at Royal Wootton Bassett on 8th Feb and also at Malmesbury on 12th April. Let's hope that they're just as successful as always! What an achievement and what an event! 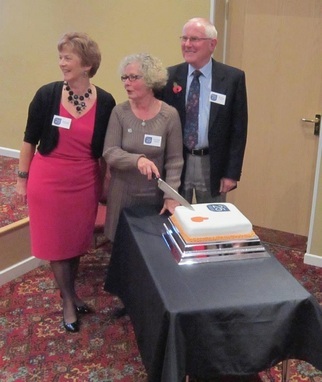 The North Wilts MNDA Group has been raising money for the Association and people living with MND for 25 years. Set up by our avid fundraiser, Anne Collison and her Mum, Ruby, the Group has flourished over the years and is now stronger than ever. Anne is now stepping back a little to take a well deserved rest. Bob, our Vice Chair, is also reducing his involvement and we thank him for his invaluable support over the years. Our anniversary event came at a time when there were a number of things to celebrate including the fantastic amount of money raised by the family of Martin O'Shea from Corsham. By organising and participating in so many events, Martin's family and friends have collected a remarkable amount of money, totalling over £21,000! The Group are hoping that this money can be used to help fund a new Co-ordinator role to help families liaise with the NHS. The local area can also celebrate the appointment of Graham Lennox, Consultant Neurologist at GWH, who came and gave a very informative talk at the event and informed us that since his appointment, the hospital has recruited a further four specialist neurologists which is great news! We can also celebrate the appointment earlier this year of Sally Light, Chief Executive of the Motor Neurone Association. Sally also gave a presentation and speech at our event and laid out the strategies and plans for the future of the Association, which are very clear and exciting. 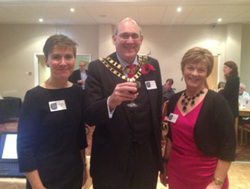 We would like to thank all those who attended and made the evening such a success including guests living with MND, families and friends of people with MND, healthcare professionals, fundraisers, committee members, the Mayor of Swindon and the fab catering company who provided lovely food and drinks! We are "Looking back with thanks and looking forward with confidence". Come and visit the lovely market town of Malmesbury on Saturday 12th October - say hello to Anne on the MND stall and help us raise funds for the North Wilts Group! 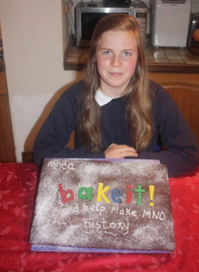 June's Awareness Month Bake It events have made a great contribution to the MND coffers. Barbara and Andrew raised £200.00 and Susanne almost hit the £300.00 mark. Unfortunately Emily didn't manage to hold her Bake It event as she had a baby instead!!! Congratulations to Emily and her family!! 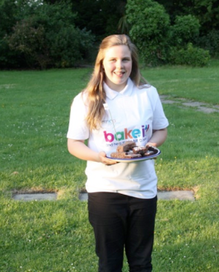 Alison's niece, Saskia made Chocolate Brownies, Chocolate Crispy Cakes and a selection of cookies and with the help of her close friends sold them to fellow students during their half hour morning break at school, raising an amazing £65! Five intrepid children have already embarked on their first as they look to raise money for charity. 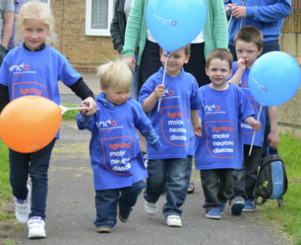 Five-year-old Tegan Wallis and her two-year-old brother Archie will be joined by their cousins Mason, four, Taylor, two, and their second cousin three-year-old Finley Ellis, as they complete the 13-mile challenge to raise money for the Motor Neurone Disease Association. 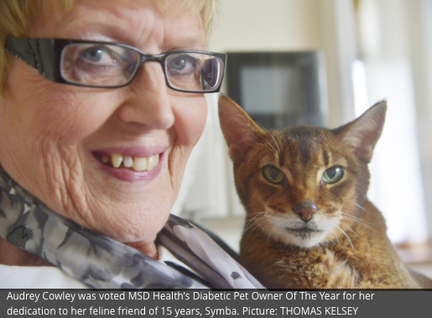 They decided to take on the challenge after their great-grandmother, Cherry Reed, 60, was diagnosed with the illness. On 28 April I ran the Plymouth Half Marathon for MND, I ran the 13.1 miles in 2:12:41 raising over £150 which will be matched by my employers. 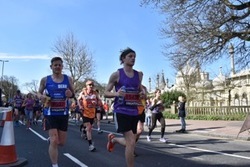 The Plymouth Half Marathon was my 4th Half Marathon and my 2nd in 6 weeks. 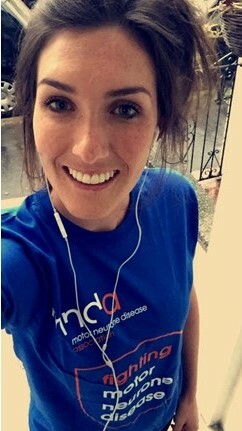 I chose to run for MND as my step Nan was diagnosed with the disease in 2012 and I wanted to help raise money for the fantastic support and help they give to all sufferers. "I'm cycling 2,500 miles around Britain in one month - 11 August to 8 September - to raise awareness of MND. That's roughly 100 miles a day, most days. I'm sick of sitting at a desk all day - I want to celebrate my mobility and stop taking it for granted. In my journey around the country, I will pass through over 45 different counties. I lost my Mum, Ellie, to MND in May last year. Throughout her illness and since, I have been continually frustrated by how little knowledge there is about MND. 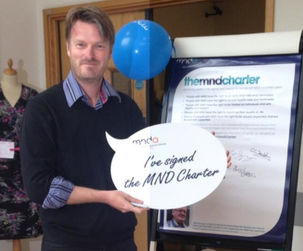 I'm determined to change that and get people aware of, and talking about MND, by taking on this massive challenge. 2,500 miles is a long old way. I'm going to be exhausted a lot of the time, and it might get a bit quiet sometimes too. So if there are any cyclists out there who want to join me for a day (or even an hour! ), to chat, pull me along, or show me the best route through their local streets, then do get in touch either on Facebook, Twitter @becsroberts, or at becsbigbikeride@gmail.com. And if you're not a keen cyclist, then don't worry, you can still help by telling all your friends about Becs Big Bike Ride. This is about awareness, so the more people who know about it, the better! A chance to put your "glad rags" on and have a lovely night out for a very reasonable price. On Monday 13th May, 15 MNDA volunteers from various Groups and Branches, attended a Media Workshop at the BBC Bristol studios in Clifton. The workshop concentrated on what was considered news and newsworthy, how to write a snappy Press Release and how to get radio or newspaper journalists to be more interested in running MND related stories. Andrew and Nicky attended on behalf of the North Wilts Group and learned some good pointers for future publicity. Jill Moody and the BBC were great hosts and made the day very enjoyable and comfortable. It felt a bit bizarre walking nonchalantly past Nick Knowles!!! 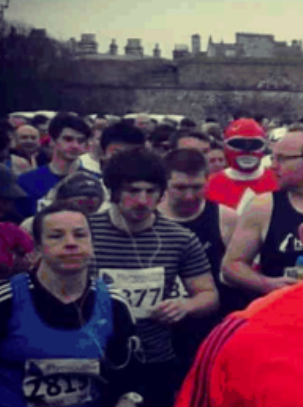 If the Marathon was a bit much how about putting your running shoes on and trying the Corsham 10K Run on Sunday 28th April from 11 am. Start & finish at Corsham Football Ground, Lacock Road. Organised by Corsham Rotary to benefit MND North Wiltshire on behalf of Martin O'Shea. If running's not your thing, we will have a stall selling cakes and preserves for afternoon tea!! Can you support our Charity Stall in Malmesbury on Saturday 13th April? They say the weather will be warm!! Awareness month is June and is getting closer. Show your support during June by organising a baking event, spreading the word and inviting guests. Ask your friends and family to get baking too as the more you bake, the more funds you will raise for MND. We would love to see your photos and share your stories! 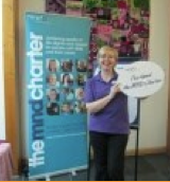 MND North Wilts wil be running a Charity Stall and Collection Day at the West Swindon Centre on Saturday 6th April. Please spread the word and come along to show your support for the continued good work done by our great volunteers. 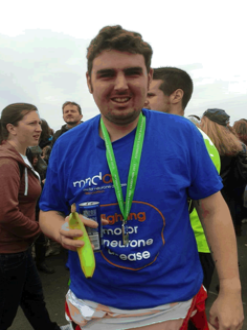 Local fundraiser, Chris Smith, will be running the London Marathon on 21st April this year on behalf of two charities and will be donating 80% of his sponsorshipmoney raised to MNDA. 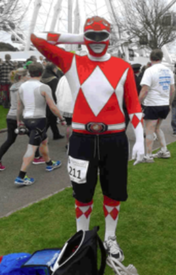 His target is £1500 so needs everyone to be as generous as possible especially as he will then be taking a break from running for a couple of years. Chris's online sponsorship account is http://www.virginmoneygiving.com/ChristopherSmith14 - just click to make a very worthwhile donation. At the end of January, a Reception was held at the Royal Society in London in support of funding for the Oxford Centre for MND Research and Care. The Reception was attended by the MND Royal Patron, HRH The Princess Royal, who spoke of her own personal connection to MND through a friend who is living with the disease. The North Wiltshire Group of the Motor Neurone Disease Association hosted its annual Thanksgiving Party earlier this month. The event is organised so that the Group can say thank you to all those who have helped raise money, as well as awareness for the disease during the last year and beyond. 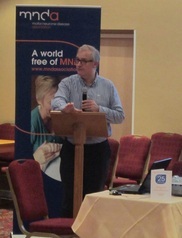 Swindon South MP Robert Buckland attended the event and spoke to those affected by the cruel disease and agreed to sign the Association's charter to help ensure that the government delivers on its promises and provides the most effective care to those suffering with MND. 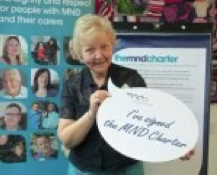 The aim of the charter is to make sure all people with MND receive the right care, in the right place, at the right time. 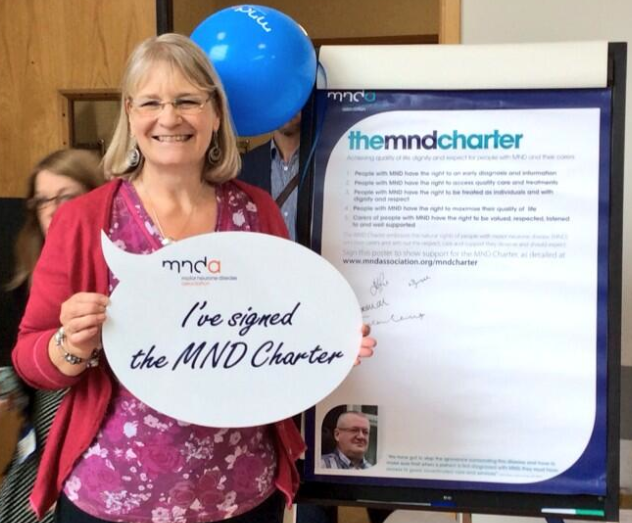 That's why we ask everyone to step up and sign the MND Charter to ensure everyone is working towards this vision. A link to the full charter can be found here. The Thanksgiving event was a big success with a great atmosphere. Everyone enjoyed themselves and some have already booked their invitation for next year! Attendance was good too and included five of the families we have supported that are affected by MND along with some local dignitaries. 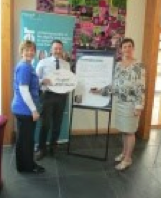 As you can see above, we even got local MP, Robert Buckland, to sign the charter while he was with us. We would like to say a big THANK YOU to everyone that made it possible and for all the hard work that went on behind the scenes. 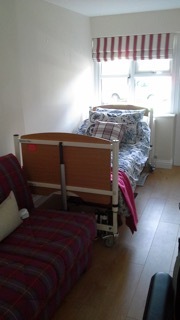 We would also like to thank Prospect Hospice for letting us use their room again and for their continued support.